1.) Should I get a TEFL/TESOL qualification? 2.) What will be my salary? 3.) Will I make enough money to live on? 4.) Will I have to pay tax? 5.) How much money should I bring with me to Korea? 6.) Will I be given a bank account and can I send money home? 7.) I want to live in a specific area of Korea. Can I request a preference? 8.) What are living accommodations like? 9.) Is South Korea a safe place to live? 10.) What types of things should I bring with me? 11.) How can I keep in touch with friends and family back home? 12.) Do I need an international driver's license? 13.) Should I get vaccinations before I come to Korea? 14.) When is my vacation time? 15.) How do I apply? A teaching certification is preferred but not required. Many of our partner schools offer higher salaries to TEFL qualified teachers. If you are interested in getting TEFL qualified, we recommend taking one of our certification courses. Please click here to get more information. The average rate for first year teachers is 2 -2.7 million Korean won per month, approximately $1900-2600 USD per month. This amount will vary from school to school but teachers with a teacher certification tend to earn higher salaries. Compared to most countries, South Korean schools pay their teachers extremely well, so the 2-2.7 million won you make per month will be more than enough to live comfortably. In fact, most teachers say that they are able to save money. Generally speaking, teachers pay tax in Korea and are exempt from paying tax again when they return to their home country (providing they completed all the required paperwork). Please check with your government tax office before coming to Korea. You should have at least US$1,000 in savings. ATM and credit cards are widely accepted throughout South Korea, but you call the card company and let them know you will be living in Korea. Your school will help you open a Korean bank account when you arrive and your school will then pay your salary into that account. South Korea has a sophisticated and internationally recognized banking system transferring money from your Korean account to another account anywhere in the world is a straightforward process. Most schools we work with offer location preference on a first come, first served basis. We work with different schools across Korea so the earlier you apply the better your chances of getting your preferred location. Your apartments will be provided by the school that hires you, so living arrangements will vary. However, teachers are generally very happy with their accommodations because apartments tend to be new and modern with plenty of amenities. Most apartments include a bed, a desk, a range, a refrigerator and a washing machine. According to crime statistics, South Korea is one of the safest countries in the world. With very low crime rates, a real sense of community and a cultural emphasis on respect for others, you will feel extremely safe during your stay in South Korea. The political situation in North Korea receives lots of media attention, but it is not new. If you ask the people of South Korea if they think that there will be a war with the North, they almost always say, "No." They have lived their lives seeing the same political back and forth and it has never led to anything serious; and it's not likely to change. You are encouraged to register with your country's embassy to say you have arrived and are working as a teacher. That way, if there is any reason why you should leave Korea (natural disaster, unexpected changes, etc) your embassy can locate you and plan your safe departure. Bring a range of clothes for work, play and the seasons. Remember, summer is hot and humid while winter is cold and snowy. Most Koreans are quite slim and are generally of smaller frame size than Westerners. If you are of slim to regular build you will be able to buy clothes and shoes in Korea. If you take larger sizes your choices will be more limited. Toiletries and personal hygiene products can all be easily purchased in Korea although deodorant, sunscreen and bug spray are all quite expensive. For ladies, tampons can be very hard to find in Asia (pads are common) so bring a good supply of your preferred brand. Because South Korea has some of the best Internet infrastructure in the world, staying with loved ones back home is easier than ever. From Facebook to Skype to email, friends and family are usually just a click away. Many teachers also get a pre-paid phone which allows you to make domestic and international calls. There is no need to bring an international license. Few teachers drive cars in Korea and most Koreans use trains, buses and subways to get around. The public transportation system in and around big cities is excellent. Although vaccinations are generally not required to get a visa, please check with your family doctor back home before leaving. Another consideration is that you might decide to go on vacation while you are in Asia. You can also get all necessary vaccinations in Korea before you travel on vacation. Vacation time is decided by your assigned school and is tied to the school calendar. Vacations are common around December and July. 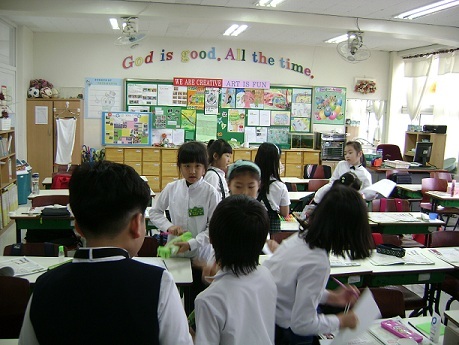 Click here to apply for ESL teaching jobs in South Korea.